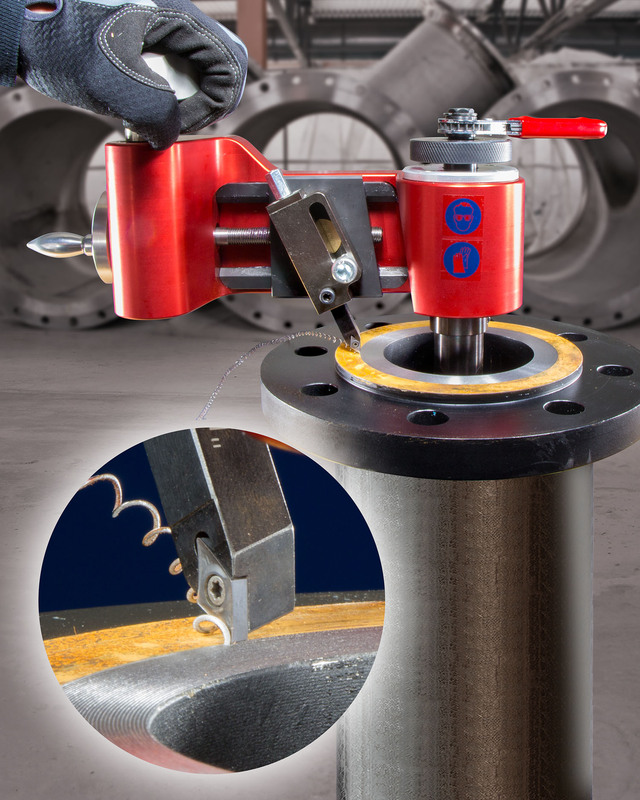 An easy to use, manually operated tool for re-facing damaged flanges and restoring them to like-new condition with a phonographic finish, virtually anywhere, is being introduced by Esco Tool of Holliston, Massachusetts. The Esco FLANGE HOG 110® is a manually operated hand tool with a rigid I.D. clamping system and a 1” to 10” I.D. range that provides a facing diameter up to 14”. Suitable for re-facing a variety of flange materials including cast iron, carbon steel, stainless steel, aluminum, and many alloys, a user simply swings the tool in a circular motion which advances the facing blade outward and creates a perfectly precise phonographic finish. Featuring 0.005” alignment accuracy, the Esco FLANGE HOG 110® incorporates a worm gear that smoothly drives a lead screw to produce a continuous and true spiral finish. Two interchangeable cross feeds are available for both a smooth and stock finish in accordance with ASME B16.5 standards. Supplied as a complete kit, the tool includes a sturdy carrying case, straight and 90 degree tool bit holders, and all necessary wrenches. The Esco FLANGE HOG 110® is priced at $5,995.00 and is available for rent.